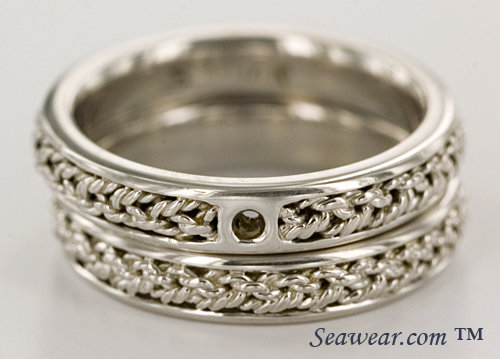 This is the most narrow Turks Head braided wedding band we could find at 4mm wide and has a single twisted strand (2 wires) braided into a channel recessed into a comfort fit band. The width is uniform all the way around and will match your solitaire setting nicely or stand out on it's own! 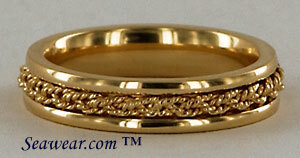 This ring is shown in a tri-color gold braid on a 14kt yellow (natural gold) gold band. Yours can be ordered in any color combination of 14kt. The band only is also available in 18kt, palladium or platinum. Allow 4 weeks as they are hand made to order and cannot be sized once they are made. 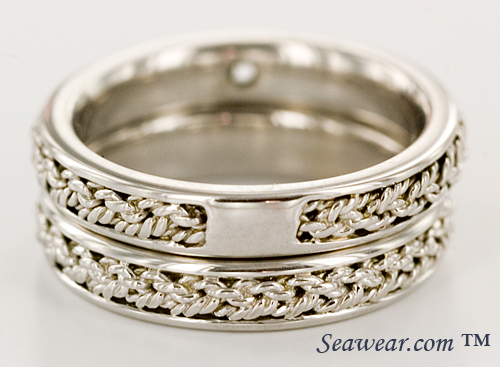 This is best suited for a feminine hand but could be worn by a gentleman as well that prefers a narrow width band. This is the 4mm sing strand done in an engagement setting with the wedding bank. Engagement solitaire is ready for your peghead to be soldered in. You can close this window or go back to Turks head jewelry or the index!